Every holiday season has its “must-have” toy or gift item that tops the shopping list. 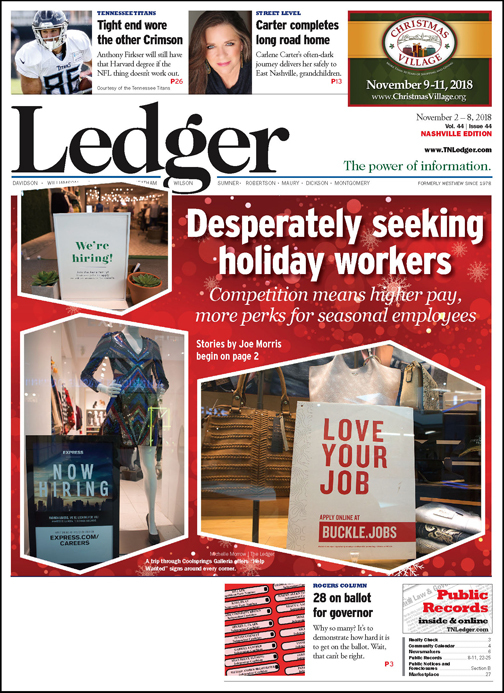 This year it’s workers, as retail and support industries struggle with a tight labor market to find enough employees to serve holiday shoppers and revelers. The combination of a steady economy, related consumer outlook and limited worker pool is causing headaches all across the retail, hospitality and service landscape. Whether it’s brick-and-mortar stores or the warehouses and distribution centers that fill online orders, the scramble is on to get people into place to handle the incoming surge of customers and orders. That means sweetening the pot with higher hourly wages, more flexible schedules, shorter hourly minimums and anything else short of full-time benefits to get seasonal workers on board. Throughout Tennessee’s larger cities and their surrounding communities, it’s a buyer’s market for anyone looking to change jobs or pick up a second job and earn some extra money. Or, for that matter, it’s boom times for someone looking to cobble together a part-time job or two long enough to see if they want to pursue a full-time career at that particular employer. 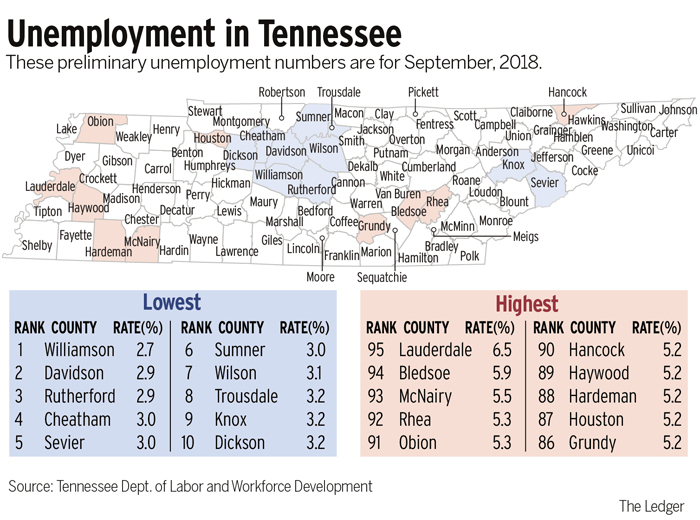 The September unemployment rate for Davidson County was 2.9 percent, The Tennessee Department of Labor & Workforce Development states. Adjacent Williamson County led the state with 2.7 percent, followed closely by Rutherford County at 2.9 percent and Cheatham at 3.0 percent. Dickson, Wilson and Sumner counties are equally employed. In East Tennessee, Sevier County, which always needs a large influx of seasonal help, was at 3.0 percent, with Knox County at 3.2 percent. The Chattanooga area, while a bit higher, was at 3.9, more than the the state average of 3.3 percent but less than the national score of 4.1. Those rates mean many types of businesses are needing help, industry watchers say, and not just the usual retail/hospitality industry suspects. What’s more, those amped-up holiday salaries and incentive packages might not go away after Jan. 1, 2019. Booming Nashville and its encircling counties have been experiencing a labor shortage, particularly in hospitality, for some time, so it’s no surprise that the holidays will put an additional squeeze on restaurants, event venues and the like. Now add to that the need for retailers and others whose fourth-quarter earnings are boosted by holiday shopping, and it’s a perfect storm for hirers and just plain perfect for job seekers, explains Brenda Franklin, senior branch manager with Nashville staffing firm Hire Dynamics. “Right now, we are looking at about four opportunities for every individual who walks through the door,” Franklin says. “And these are perfectly fitted opportunities, not just openings, so people have choices. That means just working a few hours on the weekend or making a higher wage if willing to work on an overnight shift, opportunities that weren’t available even a couple of years ago. E-commerce retailers and their fulfillment centers need people just like their physical counterparts, so everyone’s offering a good deal right now, Franklin says. Want to help childern build a bear this holiday season? 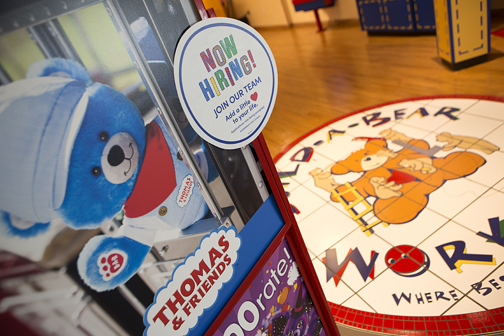 The Build A Bear Workshop, along with practically every other retailer, is hiring. “The war for talent is alive and well, and that’s because it’s a buyer’s market. Flexibility and wages are what’s going to land you that worker, and companies are having to adapt to that reality. The true part-time person has a very limited window they want to work, and companies are going to have to accommodate that. “Warehouse workers – pickers, packers and forklift – seem to be one of the ‘hot job’ categories” in the East Tennessee area now, says Julie Hansen, senior vice president of Randstad US, a staffing agency with several offices the state. For Knoxville and the surrounding area, that points to a strong 2019, Hansen acknowledges. A UPS worker leaves Justice at Coolsprings Galleria after dropping off a package. The girls’ clothing store is one of many looking for holiday workers. In the meantime, she says East Tennessee job seekers should look into positions at online and physical retailers, and any related industry that sees a usual seasonal spike. And as for employers, “We continuously have conversations with our clients around expectations on the kinds of skills they can expect to hire for based on the pay rates they are willing to offer,” Hansen reports. Pundits have been predicting for years the death of the large shopping mall. But some Tennessee facilities didn’t seem to get the memo, says Stacey Keating, director of public relations and corporate communications for CBL Properties, which operates Hamilton Place and Northgate malls in Chattanooga, as well as CoolSprings Galleria in Williamson County just south of Nashville. “The National Retail Federation has released holiday forecasts showing sales will increase 4.2 percent to 4.8 percent this year,” Keating points out. 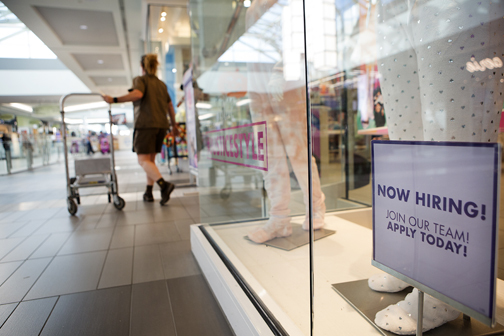 “That means our retailers have had to get prepared to go into full swing for hiring. Those hiring are having to compete with others under the same roof and are offering incentives and other deals that might not have been as prevalent in the past, she adds. Another shift in the hiring landscape may be away from the so-called sharing economy, where people do everything from drive for ride-share providers to shop for groceries, run errands and myriad tasks in which buyer and provider are matched through online portals. If you’re out of work, or only have a little time, those options may appeal. But if better money can be had in the traditional workplace, people are likely to pursue that avenue, Franklin predicts. “People are catching on that for many of those sites it’s not much money for a lot of work, and it’s unpredictable,” she says. “Sure, it’s flexible, but if you’re not making much money, it’s not a good deal. “We see a lot of people who may drive for Uber or Lyft, just as an example, who want more work. They want that flexibility, but they also want a set rate per hour and a set number of hours per week. One thing that hasn’t changed, but is getting turbocharged, is the ability for temporary workers to move into a company’s regular employment ranks following seasonal work. Many seasonal workers also are looking for a more permanent gig, and so they are vetting that employer while on the job. At the same time, employers have long looked at the expanded holiday staff roster as a talent pool to be mined for good permanent employees. That’s only ramping up on both sides in a tight market, both in Tennessee and nationwide, says Greg Dyer, president of Randstad Commercial Staffing. “When you have employment this high, you’ll see employers having to adjust the ways they screen candidates,” Dyer points out. “In the past you’ve seen background checks, credit checks and other processes for many hires, and for certain jobs, they’re not going to relax in that area. Also, he predicts, “Former employees and retirees, people who have experience, are going to get looked at if they want to return, and that might not have happened before. Companies are getting very flexible in many regards because they need to have a full staff and so they have to adjust to make that happen. “Our figures show that more than a third of people being hired during the holidays are now being converted to a permanent position, and we think that will climb as the labor market stays this contracted,” adds Hire Dynamics’ Franklin.